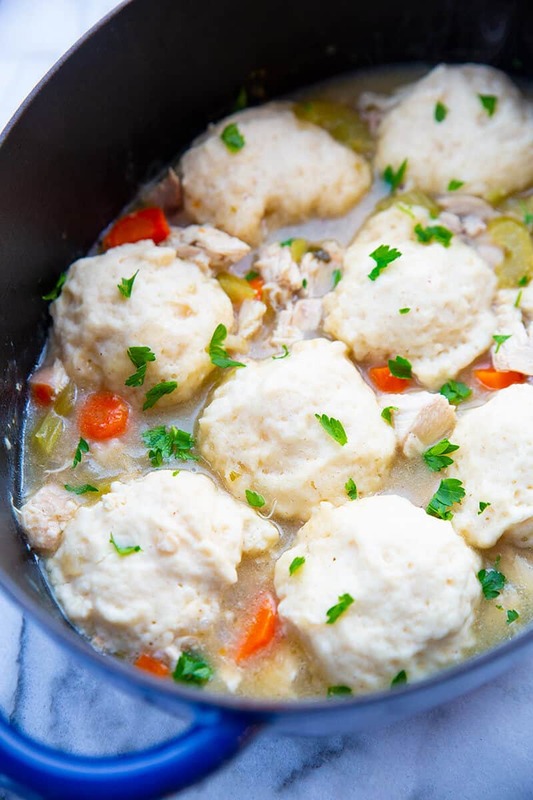 I love cooking up a pot of chicken and dumplings when I want some delicious comfort food! Bisquick™ Chicken and Dumplings is a hearty home-cooked meal that’s perfect for cosy family dinners or dining with friends. We used this recipe a lot when I was growing up, and the smell of that familiar aroma in the kitchen makes me feel like I’m a kid again! Isn’t it funny how often we associate food with different periods or events in our lives? It’s almost like turning back time! Pre-heat your oven to 375 °F. Clean any extra fat from the chicken. Slice it into pieces (or in half like I did). Place into a large dutch oven. Add in the celery, carrot, onion, garlic, parsley and chicken stock. Place the lid on the Dutch oven and place into the oven. Cook in the oven for 2 2-12 hours until the chicken is completely cooked and has reached a temperature of minimum 165°F). Remove the Dutch oven from the oven. 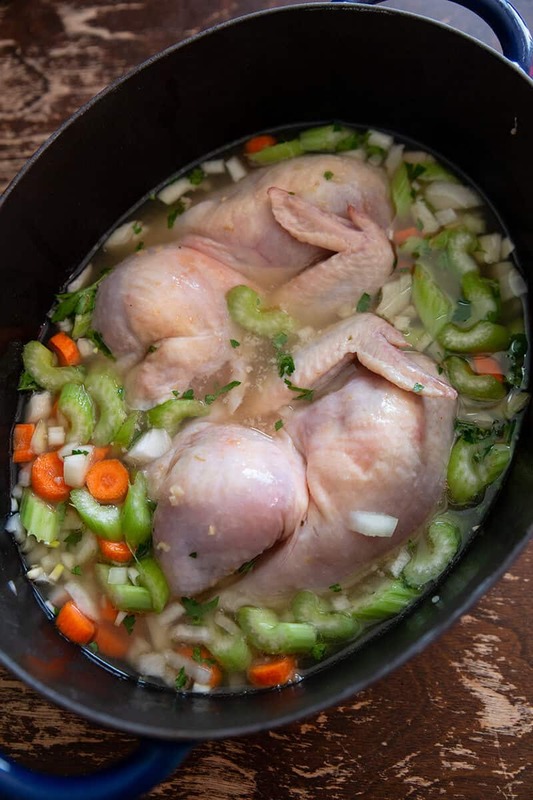 Using a slotted spoon or tongs, remove the chicken and vegetables from the Dutch oven and place in a bowl or plate to the side. Take 1/2 cup of the chicken broth that is left and set to the side for now and let cool. 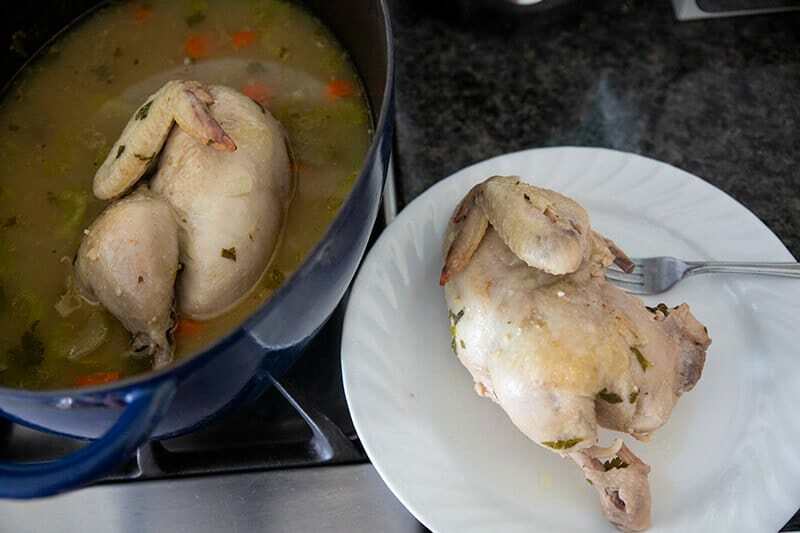 One you can safely touch the chicken, remove the meat from the bones and set aside. Discard the bones. Take the reserved broth and whisk the cornstarch into the mixture. Place the Dutch oven on your stove burner on medium-high heat. Bring the remaining broth to a low boil. Whisk in the cornstarch mixture quickly to thicken the broth. You can add more cornstarch if you want it really thick, adjust to your liking. Add the chicken and vegetables back into the Dutch oven and reduce the stove heat to low. Simmer for another 10 minutes. In another bowl, stir the remaining 2 cups of Bisquick™ mix and the milk together until completely combined and formed into a sticky, soft dough. Drop the biscuit dough by large tablespoonfuls onto the hot chicken mixture. I like to drop it onto areas that have liquid in order for the biscuits to not be dried out. Place the lid back on the Dutch oven and cook for 10 minutes. Take off the lid and continue cooking for another 5-7 minutes until the biscuits are done. Can you substitute water for milk in Bisquick™ dumplings? It’s totally fine to substitute water for milk in Bisquick™ dumplings. It might make your biscuits or pancakes a tiny bit drier but it won’t affect the taste at all. If you want to try adding some extra flavor you could even substitute a rice or nut milk instead of water. I haven’t tried it myself but I’ve seen it mentioned online before and I definitely want to give it a go sometime! Is Chicken and Dumplings Supposed To Be Thick? 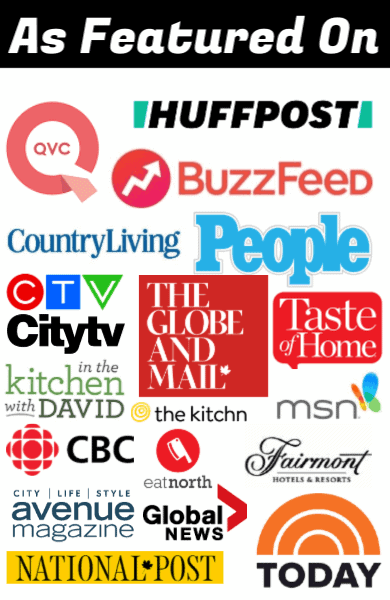 Some people like their chicken and dumpling recipe to come out a little thicker and some don’t, it’s all down to personal taste! I like mine a little on the heavier side, so I add a little extra cornstarch to the broth until I’m happy with the consistency. 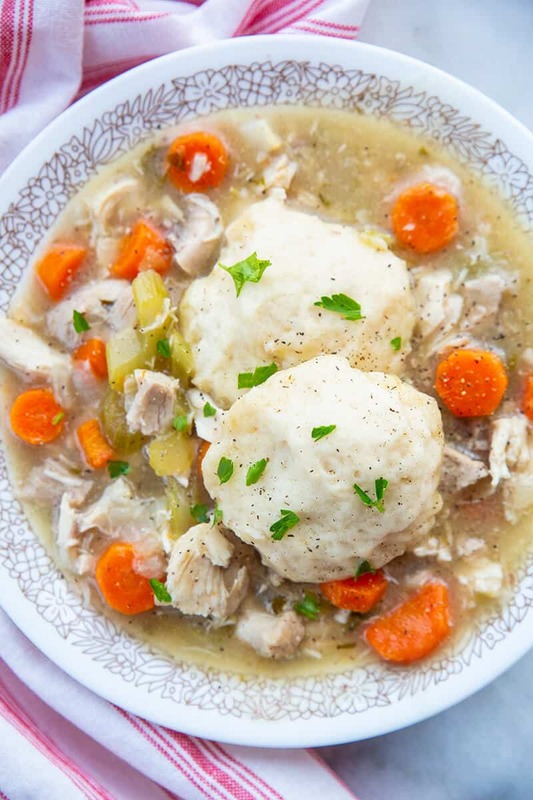 If you want to make this meal completely from scratch, try my Homemade Dumplings Recipe that I use for my slow cooker meals – it will work exactly the same on top of this meal! You can freeze your chicken and dumplings but I don’t really recommend it to be honest. The dumplings don’t do well when they’re reheated and get a bit grainy, so it never really tastes the same! If you do have leftovers you don’t want to dump, don’t reheat them in the microwave because it’ll ruin the dumplings. It’s better to reheat the chicken and broth on its own in the microwave and add the dumplings after when the mixture is hot. I personally prefer to only make enough dumplings for one serving/s at a time and then add a fresh batch of dumplings to any chicken and broth leftovers I’ve reheated. This takes a bit longer (about 20 mins) but it’s definitely worth the difference it makes to the taste! If you want to add some extra flavors/variations to your Bisquick™ Chicken and Dumplings, you can simply change up the vegetables you add. This will also come in handy if your family aren’t fans of any of the vegetables I’ve listed in this recipe. Why not try adding or swapping in some green beans, broccoli, and/or corn to give your taste-buds something to think about! The Bisquick™ Impossible Quiche Recipe: this is a delicious quiche recipe that’s perfect for Moms and Dads on the go! Classic Bisquick ™Sausage Balls: a great holiday appetizer that can also double up as a super filling and yummy breakfast option! How to Make Bisquick™ Pancakes: thrown out the box for your Bisquick mix? Don’t worry, I’ve written this mouth-watering recipe up for you here! 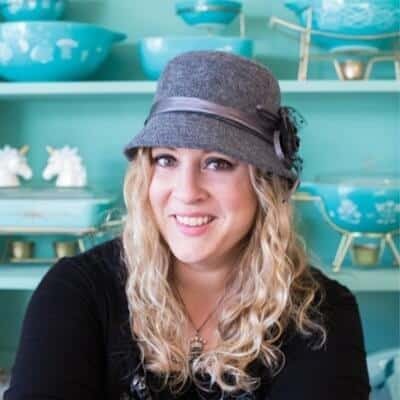 Bisquick™ Peach Cobbler Recipe: I’ve given this traditional recipe a delicious modern twist! 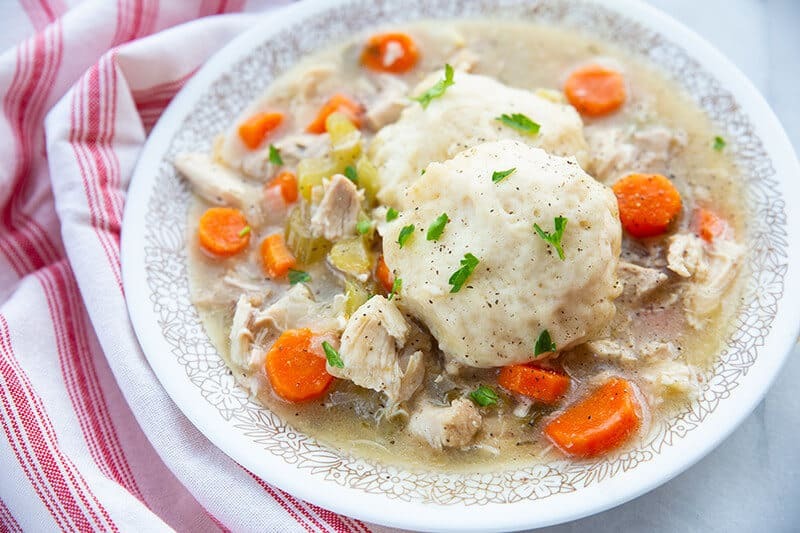 This classic Bisquick™ Chicken and Dumplings is a decadent chicken stew made with a whole chicken from scratch and is chock full of vegetables, - your family will LOVE it! Clean any extra fat from the chicken. Slice it into pieces ( or in half like I did,) Place into a large dutch oven. A lot of recipes don't cover the dumplings with a lid and this is a mistake! Steam the dumplings for 10 minutes and then take off the lid and let the tops dry off somewhat. The dumplings will be light, puffy and tender!